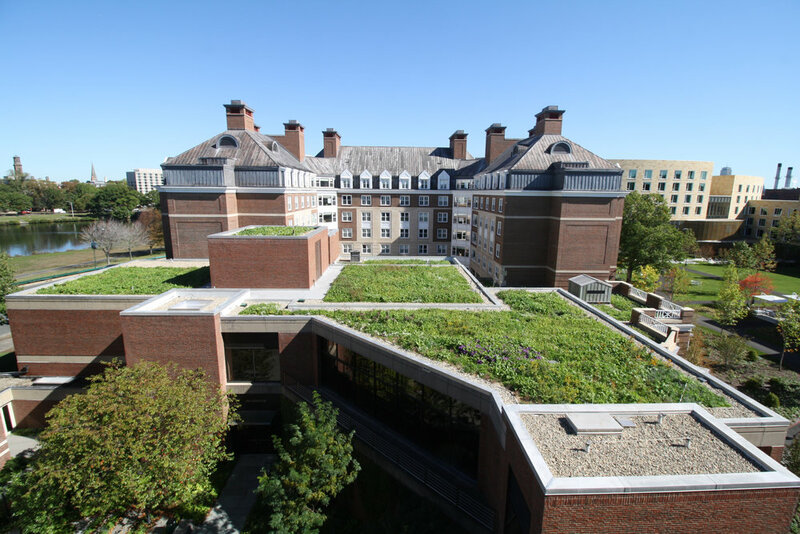 Partnering with Recover Green Roofs Boston, Omni supplied the 8,300-square-foot Omni Green Roof meadow for Harvard Business School’s McArthur/McCullom Hall. The multi-tier green roofs mark the New England debut of Omni’s comprehensive green roof technology. The plant design takes inspiration from the adjacent Charles River ecosystem; milkweed, aster, rudbeckia, and other native perennials blend into a seeded mix of quickly germinating cover crops including flowering buckwheat, daikon radish, and clover. The meadow seed mix unifies the seven roofs while distinct clusters of herbaceous and woody perennials create a distinctive patterning. The meadow is a prime example of passive farming within Omni green roofs. A surprise harvest of 400+ pounds of rooftop radishes was incorporated in the facility’s dining hall menu.